The model 4714 is capable of controlling remote DC loads to 3 amperes at voltages up to 36V DC. 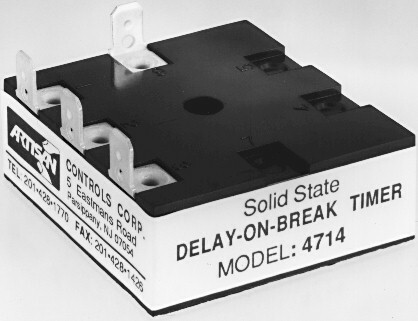 Closure of the Initiate Switch turns on the remote load circuit and resets the timing to zero. Opening the initiate switch starts a preset timing period. The load circuit remains energized until the timing period has elapsed, then de-energized, returning to the Zero Power state. If the initiate switch is reclosed before the timing period has been completed, the timing cycle will reset and the load circuit will remain energized. Operating Current Zero in standby, less than 20 mA plus load current while load circuit is energized. Timing Range 0.1-10,000 Seconds fixed. Recycle Time Initiate switch may be re-closed 25 milliseconds after the output contacts have opened.